For other uses, see Boaz (disambiguation). Boaz (/ˈboʊæz/; Modern Hebrew: בועז Bốʿaz; Massoretical Hebrew: בֹּ֫עַז Bṓʿaz; Hebrew pronunciation: [ˈboːʕaz]) is a biblical figure appearing in the Book of Ruth in the Hebrew Bible and in the genealogies of Jesus in the New Testament and also the name of a pillar in the portico of the historic Temple in Jerusalem. The word is found 24 times in the Scriptures, two being in Greek (in the form "Booz"). The root בעז, just used in the Bible in relation to "Boaz" (see The Temple), perhaps expresses 'quick(ness)'. The etymology of the name has been suggested by many  as be'oz, "in the strength of", or bo'oz, "in him (is) strength" from the root 'zz, "to be strong", hence the use of the name "Boaz" for one of the pillars at the portico of the temple (1 Kings 7:21), although Biblical scholar Martin Noth preferred "of sharp mind". The son of Rachab of Matthew 1:5 (who may be Rahab of Jericho) and Salmon, Boaz was a wealthy landowner of Bethlehem in Judea, and brother of Elimelech, Naomi's late husband. He noticed Ruth, the widowed Moabite daughter-in-law of Naomi, a relative of his (see family tree), gleaning grain in his fields. He soon learns of the difficult circumstances her family is in and Ruth's loyalty to Naomi. In response, Boaz invites her to eat with him and his workers, as well as deliberately leaving grain for her to claim while keeping a protective eye on her. Ruth approaches Boaz and asks him to exercise his right of kinship and marry her. Boaz accepts, provided that another with a superior claim declines. Since the first son of Ruth and a kinsman of her late husband would be deemed the legal offspring of the decedent and heir to Elimelech, the other kinsman defers to Boaz. In marrying Ruth, Boaz revives Elimelech's lineage, and the patrimony is secured to Naomi's family. According to Josephus, he lived at the time of Eli. "Boaz" was the name of the left one of the two frontal columns of Solomon's Temple, the other being "Jachin". Its meaning is a subject of controversy. Boaz is mentioned in both the Gospel of Matthew and the Gospel of Luke as an ancestor of Jesus. In the Talmud, some rabbis identify Boaz with the judge Ibzan of Bethlehem. "I.e., Bethlehem in Zebulun"; cf. Joshua 19:15. Let it be taken into consideration, however, that Boaz "of Ruth" was from Judah, whereas the two chieftains immediately ulterior to Ibzan were from Zebulun. A legend is given that he lost all his sixty children during his lifetime because he did not invite Manoah, Samson's father, to any of the marriage festivities at his house. Since Manoah was at that time without children, Boaz thought that he did not need to consider on such occasions a childless man who could not pay him back in kind (Bava Batra 91a). The Talmud tells that Boaz was a just, pious, and learned judge. The custom of using the Divine Name in greeting one's fellow-man (Rt-2.4) formulated by him and his bet din ("court [of] law") received the approval of even the heavenly bet din (Babylonian Talmud Makkot 23b; Yerushalmi Talmud Ber. ix. 14c; Midrash Ruth Rabbah to ii. 4). The midrash Ruth Rabbah states that being a pious man, Boaz on his first meeting with Ruth perceived her conscientiousness in picking up the grain, as she strictly observed the rules prescribed by the Law. This, as well as her grace and her chaste conduct during work, induced Boaz to inquire about the stranger, although he was not in the habit of inquiring after women (Ruth Rabba to ii. 5; Talmudic tractate Shabbat 113b). In the conversation that followed between Boaz and Ruth, the pious proselyte said that, being a Moabite, she was excluded from association with the community of God (Deuteronomy 23:3). Boaz, however, replied that the prohibition in the Scripture applied only to the men of Moab — and not to the women. He furthermore told her that he had heard from the prophets that she was destined to become the ancestress of kings and prophets; and he blessed her with the words: "May God, who rewards the pious, also reward you" (Targum Ruth ii. 10, 11; Pesiḳ, ed. Buber, xvi. 124a). Boaz was especially friendly toward the poor stranger during the meal, when he indicated to her by various symbolic courtesies that she would become the ancestress of the Davidic royal house, including the Messiah (Ruth R. to ii. 14; Shab. 113b). As toward Ruth, Boaz had also been kind toward his kinsmen, Naomi's sons, on hearing of their death, taking care that they had an honorable burial (Ruth Rabba to 2.20). Although Boaz was the prince of the people, he personally supervised the threshing of the grain in his barn, in order to circumvent any immorality or theft, both of which were rife in his days (Tan., Behar, ed. Buber, viii. ; Ruth Rabba to iii. 7). Glad in his heart that the famine was over in Israel, he sought rest after having thanked God and studied for a while in the Torah (Tan., l.c. ; Targum Ruth iii. 7; and Ruth Rabba ib.). Aroused out of his first sleep by Ruth, he was greatly frightened, as he thought that she was a devil; and he was convinced of the contrary only after touching the hair of her head, since devils were believed to be bald (Tan., l.c.). 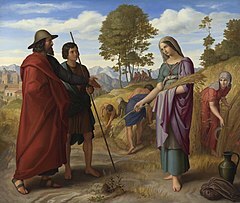 When he perceived the pure and holy intentions of Ruth he not only did not reprove her for her unusual behavior, but he blessed her, and gave her six measures of barley, indicating thereby that six pious men should spring from her, who would be gifted by God with six excellences (cf. Isaiah 11:2; Sanhedrin 93b; Numbers Rabba xiii. 11; Ruth Rabba and Targum to Ruth iii. 15; the names of the six men differ in these passages, but David and the Messiah are always among them). 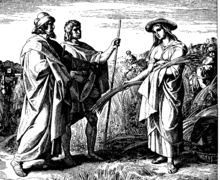 Boaz fulfilled the promises he had given to Ruth, and when his kinsman (the sources differ as to the precise relationship existing between them) would not marry her because he did not know the halakah which decreed that Moabite women were not excluded from the Israelitic community, Boaz himself married her (Ruth Rabba to iv. 1). Boaz was eighty and Ruth forty years old (idem to iii. 10), but their marriage did not remain childless, though Boaz died the day after his wedding (Midrash Zutta, ed. Buber, 55, below). In the early years of Jewish settlement, the term "a boaz" (plural "boazim"), derived from the Biblical character, was used to refer to a rich private farmer or landowner, such as the ones who flourished during the First Aliya. The term was often used with a pejorative connotation by adherents of Socialist Zionism, who were strongly opposed to "the boazim" and counterposed to them the collective Kibbutz and cooperative Moshav forms of agricultural settlement. This use of "Boaz" became obsolete in later stages of Jewish and Israeli history, and is hardly remembered today. In contemporary Israel, "Boaz" is commonly used as a male first name and carries no special political or social connotations. In the 1960 film adaptation The Story of Ruth, Boaz is played by Stuart Whitman. ^ Brazilian Midnight Call's Bible search. Retrieved on 2008-12-1. ^ Booz. Retrieved on 2008-12-1. ^ "Gustave Doré, Joshua Spares Rahab". Archived from the original on 2011-09-29. Retrieved 2011-05-23. ^ "Ant." v. 9, § 1. ^ "MT appar. ref. to" the above Boaz, "cf. 𝔗 2 Ch 317 [Qərê, therefore, is very probably an acronym]; Thes supposes name of architect or donor; Ew perh. sons of Solomon, etc. ; rd. possibly בְעֹר in strength, 𝔊 2 Ch 317 ἰσχύς; Th thinks יכין בעז a sentence, one word being engraved on each pilar, he (God) establisheth in strength; against him, however, Ke Be; Öt thinks an exclamation, in strength! expressing satisfaction of architect; Klo prop. for בעז, [the expression] בַּעַל עֹר (cf. B I K 721 Βαλαζ)"; BDB, p. 127. ^ a b c d e f g h i j JE, In Rabbinical Literature. ^ Hebrew-English Tanakh. First pocket edition. Philadelphia, PA, USA: Jewish Publication Society, 2003. ISBN 978-0-8276-0766-8. p. 547. This article incorporates text from a publication now in the public domain: Singer, Isidore; et al., eds. (1901–1906). "Boaz". The Jewish Encyclopedia. New York: Funk & Wagnalls. Barnes, W. Emery (1904). "Jachin and Boaz". Journal of Theological Studies. V: 447–451. Retrieved 2011-06-09. This page was last edited on 6 April 2019, at 23:43 (UTC).